I will go wherever time permits – parks, farms, school yards, camp grounds, vacant lots, and private yards in Indiana or neighboring states. If the search is on private property, written consent to search and if necessary dig will be required from the property owner. If the item was lost where, metal detecting is not allowed – state and federal parks – you may be able to get special permission. In order to find your lost item, you must be able to show the general area where the loss occurred. I work on a reward basis – determined by what the recovery of the lost item is worth to you and what you can afford. However, in order to cover my equipment and transportation expenses, there is a $30, call out fee, in addition to the amount agreed upon for recovery of the lost item. If the search location is greater than 10 miles from my location in zip code 46234, the call out fee will be based on time and distance. This fee is charged even if the lost item is not found. Time and distance will be calculated from Bing, Mapquest, or some other program available on the internet. I will search on dry land, beaches, or in some cases shallow water (12” or less) for any lost metal item: rings, coins, other types of jewelry, keys, watches, artifacts, metal property markers, loss recovery and/or evidence recovery for insurance companies and law enforcement agencies, etc. I was born in Indianapolis and went to public schools on the west side. Several years after joining the work force, I obtained a degree in Organizational Management from Tusculum College in Greeneville, TN. I spent most of my career working in transportation management and safety in Indiana, Tennessee, Kansas, Michigan, and Alabama. I retired in 2012, took my long vacation to the west coast, and returned to the workforce two months later. 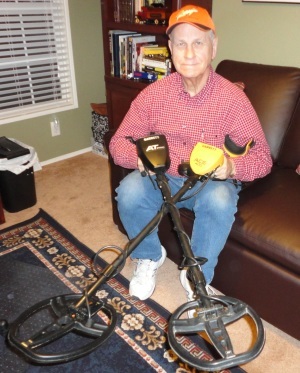 I purchased my first metal detector in 2009 and have found that my preference for detectors is those made by Garrett. I currently own a Garrett ATPro, Ace 400, and two pin pointers. In 2015, I visited my daughter and her family in Guatemala and was able to detect on the beach. My passion is to spend more time metal detecting finding lost treasures such as jewelry, coins, and artifacts. I enjoy finding and returning items that have special meaning for others.